Fund your Honeymoon - My husband and I really wanted to go on our dream honeymoon but couldn't afford it ourselves. We setup an account with Honeyfund and with the help of our guests could help us achieve our dream. Now, isn't it tacky to ask for money, you might think. That's where something like Honeyfund is great! You setup the trip of your dreams with tours, spa treatments, activities and dinners. Your guests then pick the items they want to support you with based on the amount they want to spend. You are not just asking for money but your guests can have a lot of fun taking part in planning the trip of our dreams. Amazon Wish List - What better place then Amazon to select any item you might need. They deliver and have fantastic return policies. You wouldn't even need to leave the comfort of your home if you had to send something back and money goes back into your Amazon account to use against any future purchases! Personally, I just love amazon and use them for bulky household items I don't like carrying up the steps to our house. I'm not sure our UPS delivery guy is as happy with them. 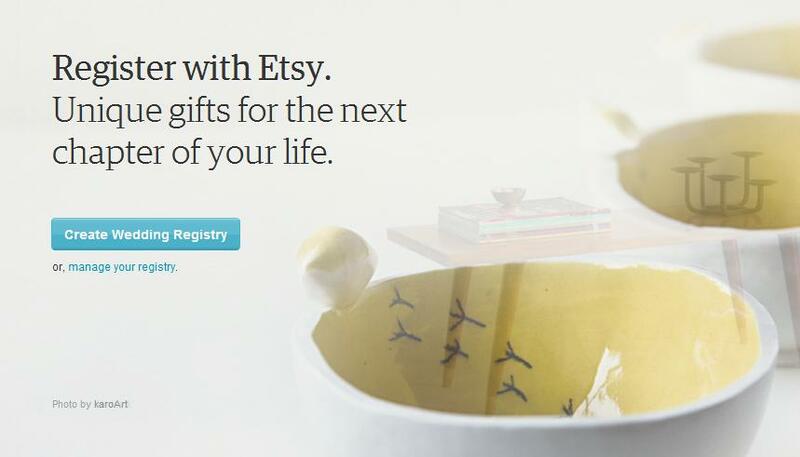 Etsy - If you haven't already visited Etsy I strongly recommend it. It's a great resource for any DIY wedding projects where you might want the look of DIY but don't have the time to "Do It Yourself". Also, you can now register to have your family and friends by you that amazingly unique gift that you can't seem to find the money to buy but would love to have hanging on your living room wall or be decorating your side table. I wish this was around when we got married! This is just a few options. I'm sure you have more to share so please let me know what unusual wedding registry ideas you have come across.